So some weeks ago I got this hawk gi for about $40 or so on amazon. I thought that was a pretty good price for a gi so I went for it. It was recently my first time using it and I have to say that it didn’t feel that much different than my extremely expensive Atama gi. The kimono itself feels a bit rough to the touch and skin, but it’s not really that much different. The pants were no different to me, although I did notice a loose thread and I’ll examine that more closely to see if it will lead to real trouble. The Hawk gi is a world away from my super comfortable Adidas challenge gi, but it’s not bad at all. I was abused and ravaged in it and it held up fairly well. It didn’t rip, tear or give. It has also survived a wash and dry session. We’ll see how it holds up to training over the coming months. If anything major happens, I’ll be sure to update this review. So far after one use I am satisfied with the product and for the price, you just can’t go wrong. 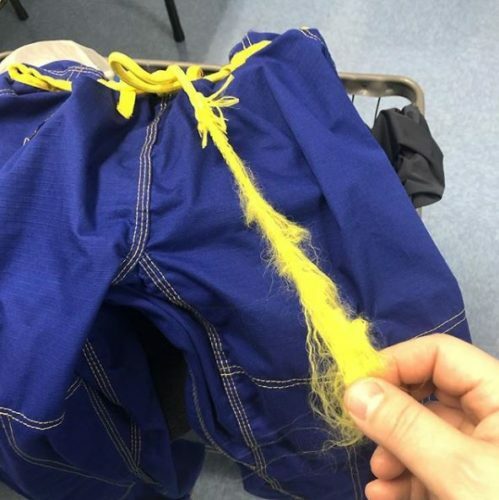 This is what my pants looked like after one use. Initially, Ortid wanted me to pay for a new drawstring and they offered me a new gi at 50% off. I refused because I didn’t think it was logical to invest more money into a product that would not survive. However, after some back and forth, they discovered that this a problem with a specific batch of gis. They offered to send me a replacement and I agreed. The size that I needed wasn’t available, so they offered me the lightweight version of their gi, and I went for it. I’ve already used that gi and washed it twice with no trouble. It’s very comfortable. After my initial displeasure, I will say that Ortid did resolve this issue in a matter that I found fair and satisfactory. If you are looking at their gis, maybe check out their lightweight gis, they are very comfy and so far strong and durable. Next Story → Don’t tap and tell!